Adam Middleton was born about 1845 in Charleston, SC. He married Rose [or Rosa] Harrison on the Watson plantation about 4 December 1867. Neither had been married before. Reverend Anthony Allston performed the marriage ceremony. Adam and Rose had the following children: Isaac, born 17 September 1873; Daniel, born 14 March 1875; Mathew Tolbert, born 8 February 1877; Doctor William, born 5 November 1878; George Oliver, born 7 December 1880. Adam Middleton died from the mumps about 20 June 1881. At the time of Adam’s death, Rose was pregnant with their 7th child Rebecca, who was born 14 January 1882. Philis Black, Rose’s mother, attended the births of the children Rose had with Adam. After Adam’s death, Rose remarried to Summerset Lawrence on 17 January 1882. The ceremony was performed by Reverend Anthony Allston. Adam Middleton was a private in Company G, 34th Regiment US Colored Volunteer Infantry. 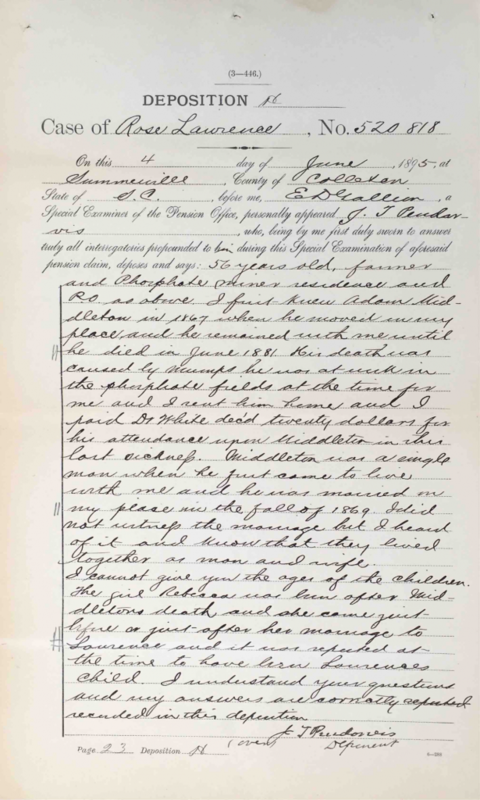 Rose’s application for a pension for Adam’s children under 16 years of age was referred to a special examiner to verify Adam and Rose’s marriage and the date it occurred, Rose’s remarriage and the correct names and ages of Adam and Rose’s children. Special Examiner E.D. 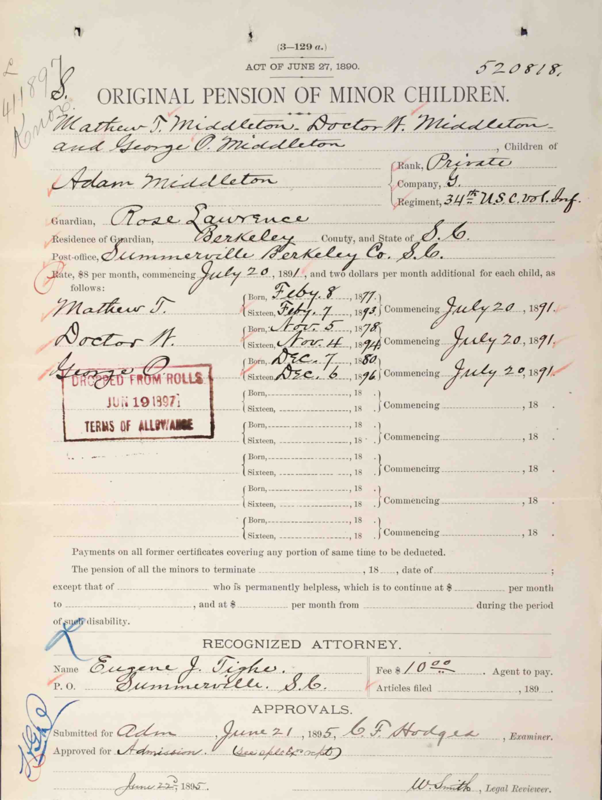 Gallion recommended approval, and Rose, who had remarried to Summerset Lawrence, began receiving $8 per month, commencing 20 July 1891 and $2 per month for his minor children: Mathew T., born 7 February 1893; Doctor W., born 4 November 1894; and George O., born 6 December 1896. 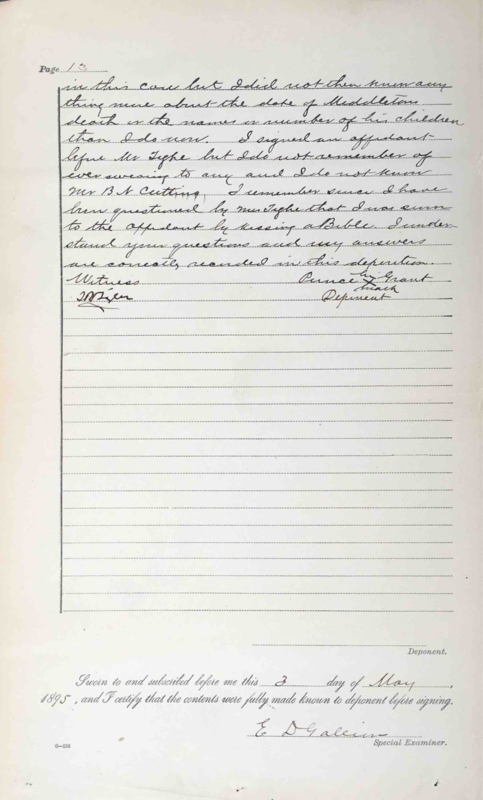 Pension of Minor Children,Pension File of Adam Middleton, Company G, 34th USCT, Certificate #411897. Testimony of Rose Lawrence, Pension File of Adam Middleton, Company G, 34th USCT, Certificate #411897. 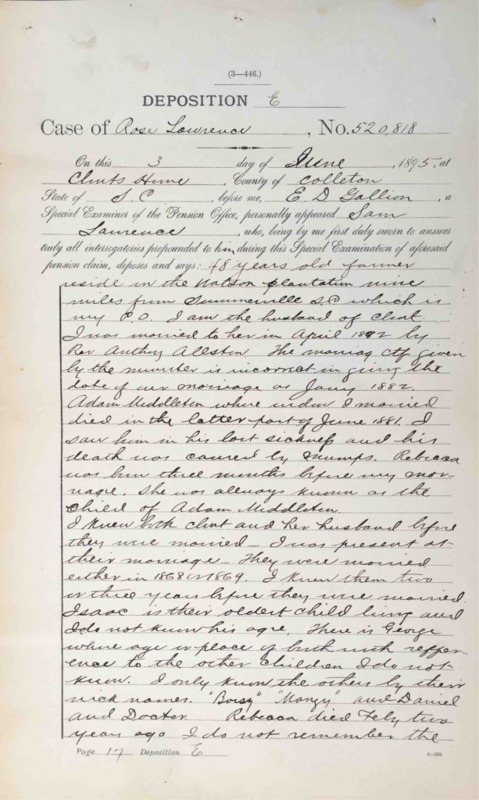 Summary of statement of Rose Lawrence, 3 June 1895: Rose Lawrence stated she lived with her husband, Sam Lawrence, near Bacon’s Bridge, Colleton County, SC on the Watson plantation. She was applying for a pension as the widow of Adam Middleton who served in Company G, 34th Regiment US Colored Troops and as the guardian of his minor children: Isaac, Mathew, Doctor, George, and Rebecca. She married Adam about four years after peace was declared. They were married on the Watson plantation by Rev. Anthony Allston. Her husband was a private in the service. She did not know when he enlisted or discharged. She did not meet him until June 1882. There was no record kept of his death but Dr. C.G. White said it was caused by the mumps. She had no record of their marriage to Adam. Her name was Rose Harrison when she married him. Neither of them had been previously married. After Adam’s death, she remarried on 17 January 1882. Her second husband’s name was Summerset Lawrence. Rev. A. Alston married them. She and Adam had the following children: Isaac, born 17 September 1873; Daniel, born 14 March 1875; Mathew Tolbert, born 8 February 1877; Doctor William, born 5 November 1878; George Oliver, born 7 December 1880; and Rebecca, born 14 January 1882. Most of the dates were recorded in her Bible by Isaac Bartlett because Adam could neither read nor write. Her son, Isaac, lived with her but he was working out. Daniel went away from her in the Spring of 1893 and she did not know, at the time of her statement, whether he was alive or dead. Mathew was living with her. Doctor was at work at the B[illegible] Phosphate Mines in Colleton County, SC. George lived with her. Rebecca died in February 1893. Rose stated she was not sure of the year that Adam died. It may have been in June 1881. She knew she married Summerset Lawrence in cotton-planting time and her daughter, Rebecca, was born about four months later. She was pregnant with Rebecca when Adam died. Adam was sick in bed for two months before he died. She was married to Adam for nine months when she gave birth to William. She stated she married Adam in December and in the following October she gave birth to William who died when he was two years old. Philis Black, Rose’s mother, attended the births of the children Rose had with Adam. Summary of letter to Commissioner of Pensions, 1 June 1895: Adam Middleton served in Company G, 34th Regiment US Colored Troops. He married Rose Harrison about 1869. Adam died from the mumps in June 1881. Rose married Summerset Lawrence either in January or April 1882. Marriage Certificate Rose Middleton and Summerset Lawrence, Pension File of Adam Middleton, Company G, 34th USCT, Certificate #411897. 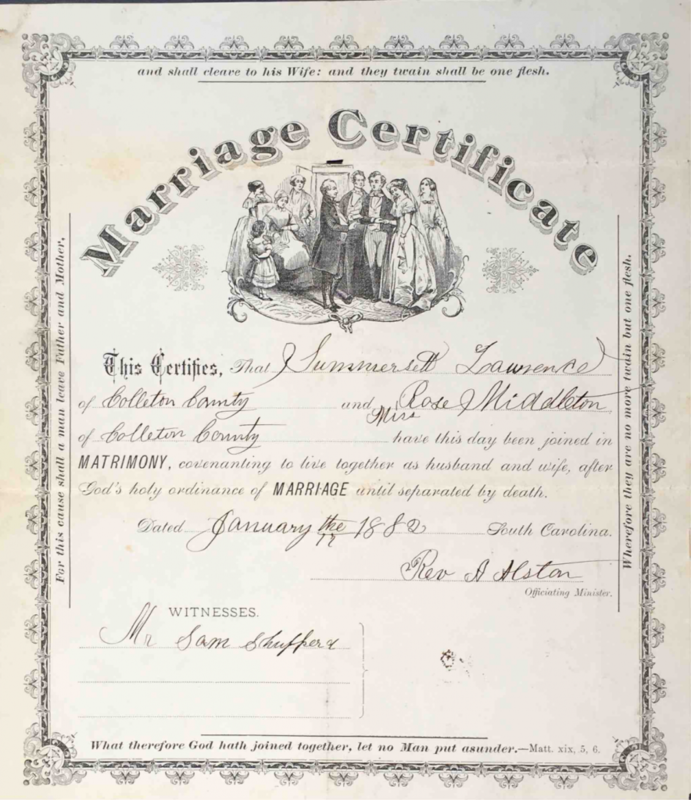 Marriage Certificate, 17 January 1882: Rev. A. Alston married Summersett Lawrence of Colleton County, SC and Mrs. Rose Middleton also of Colleton County on 17 January 1882. 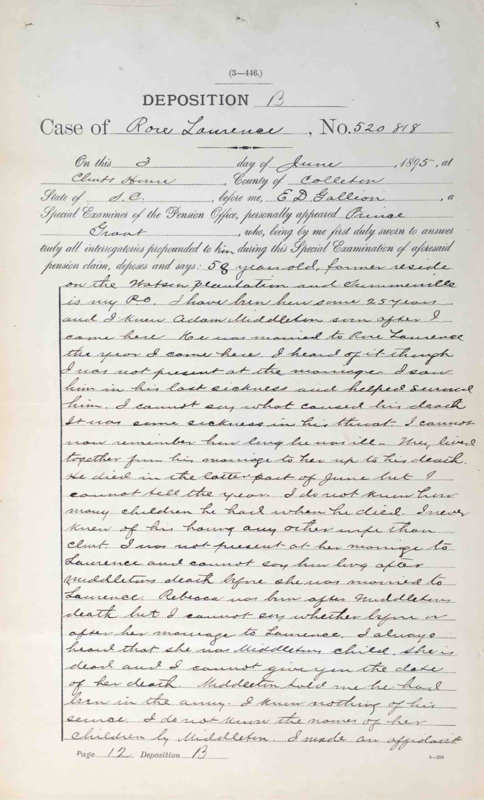 Testimony of Bill Williams, Pension File of Adam Middleton, Company G, 34th USCT, Certificate #411897. Summary of statement of Bill Williams, 3 June 1895: He had known Rose Lawrence since she was a girl. He knew Adam Middleton when he was a boy. He was not present at their marriage but he was present at the death of Adam which was caused by mumps. He died in June. His wife, Rose, was pregnant with their daughter, Rebecca, at the time of Adam’s death. Testimony of Prince Grant, Pension File of Adam Middleton, Company G, 34th USCT, Certificate #411897. 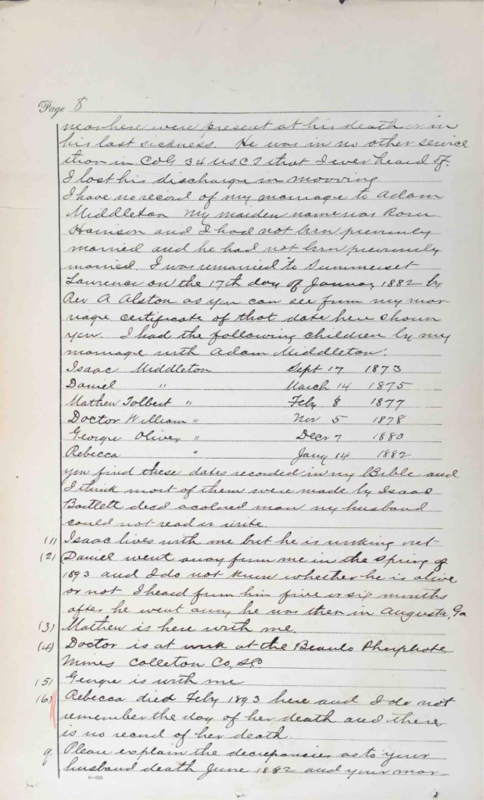 Summary of statement of Prince Grant, 3 June 1895: He met Adam Middleton soon after Prince moved to the Watson plantation in Colleton County, SC. Adam was married to Rose the year Prince moved there. Prince saw Adam during his last illness but he did not know the cause of Adam’s death except that it was some sickness in his throat. Adam died in the latter part of June. Summary of statement of Rosa Lawrence, 3 June 1895: Her son, Isaac, left about July 1894 to work for himself. Daniel left in the spring of 1893. Mathew, Doctor, and George were still with her. 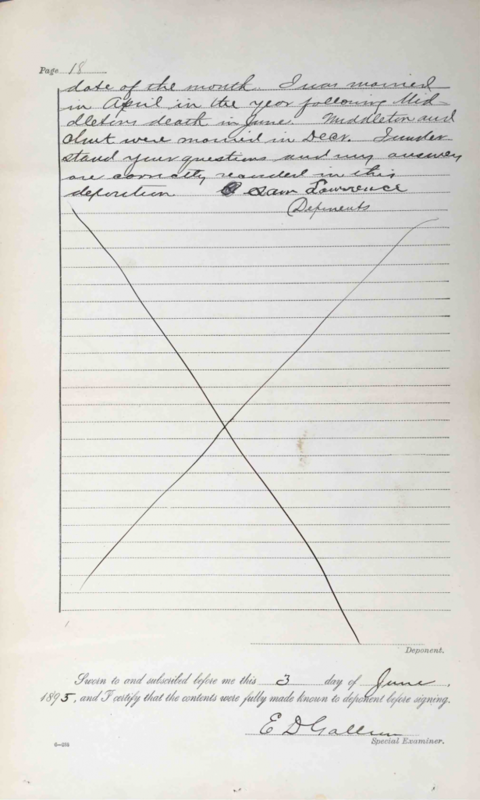 Doctor began working at B[illegible] Mines in March 1895. Summary of statement of Rev. Anthony Alston, 3 June 1895: He was a minister of the gospel at the 1st Baptist Church of Summerville, SC. He married Adam Middleton and Rose Harrison but all of his records had been burned 12 or 15-years before his statement when the house of his clerk, Carter Rivers, was destroyed by fire. He stated he began preaching the fifth year after Emancipation. He did not marry Adam and Rose until after he was ordained on 10 April 1870. Adam and Rose were living on the Watson plantation when they were married. They were young when they were married. Rev. Alston married Sam [Summersett] Lawrence about five years prior to this statement. Testimony of Sam Lawrence, Pension File of Adam Middleton, Company G, 34th USCT, Certificate #411897. Summary of statement of Sam [Summersett] Lawrence, 3 June 1895: He stated he was the husband of Rose Lawrence and was married to her in April 1882 by Rev. Anthony Allston. Adam Middleton had died in the latter part of June 1881 and Sam saw him in his last sickness. His death was caused by mumps. Rebecca, Adam’s daughter, was born about three months before Sam married Rose and she was always known as the child of Adam and Rose. Sam knew both Adam and Rose before they were married in either 1868 or 1869. He knew they had the following children: Isaac, George, “Boisy,” “Mangy,” Daniel, and Doctor. Rebecca died in February 1893. Sam stated that Adam and Rose were married in December. Summary of statement of T.R. Tighe, 5 June 1895: He was told that the dates of Rose Lawrence’s children with Adam Middleton were written in her Bible by her husband, Sam [Summersett] Lawrence. Summary of statement of Tena Green, 4 June 1895: She lived on Mr. Pendavris’ plantation. She remembered when Adam Middleton died though she could not recall the year of his death. She stated that Rose had married Sam Lawrence about April 1882. Summary of statement of James Miller, 4 June 1895: He served in Company G, 34th Regiment US Colored Troops. He and Adam Middleton were mustered into service in March 1865 at Charleston, SC and were mustered out at Mt. Pleasant, SC in February 1866. James knew Adam after they left the service until Adam died. Summary of statement of Joseph Brown, 4 June 1895: He served in Company G, 34th Regiment US Colored Troops with Adam Middleton. They enlisted and were mustered out at the same time and place. Joseph knew Adam when Adam was a boy. Adam’s wife was Rose Harrison and they were married about five years after Adam was discharged at the Doss place which was the Watson place at the time of this statement. He knew Rose married Summerset Lawrence, a cousin of Joseph’s, after Adam died. Testimony of J.T. Pendarvis, Pension File of Adam Middleton, Company G, 34th USCT, Certificate #411897. Summary of statement of J.T. Pendarvis, 4 June 1895: He first knew Adam Middleton in 1867 when he moved to the Pendarvis place. He remained there until he died in June 1881 from the mumps. He worked in the phosphate fields and Mr. Pendarvis rented a house to Adam. Pendarvis paid Dr. White $20 to attend Adam in his last sickness. Adam was single when he first lived at the Pendarvis place. He was married there in the Fall of 1869. He knew Adam’s daughter, Rebecca, was born to his wife, Rose, after Adam died. Testimony of Benjamin Ederly, Pension File of Adam Middleton, Company G, 34th USCT, Certificate #411897. Summary of statement of Benjamin Edney, 4 June 1895: He served in Company K, 128th Regiment US Colored Troops. He first knew Adam Middleton in 1865 and then for the rest of Adam’s life. Benjamin was present at the marriage of Adam and Rose in 1869 at what was, at the time of his statement, the Watson farm. Summary of statement of Rev. Anthony Alston, 3 June 1895: He stated he recalled that he had married Adam Middleton and that Adam died. His widow, Rose, then married Sam Lawrence. 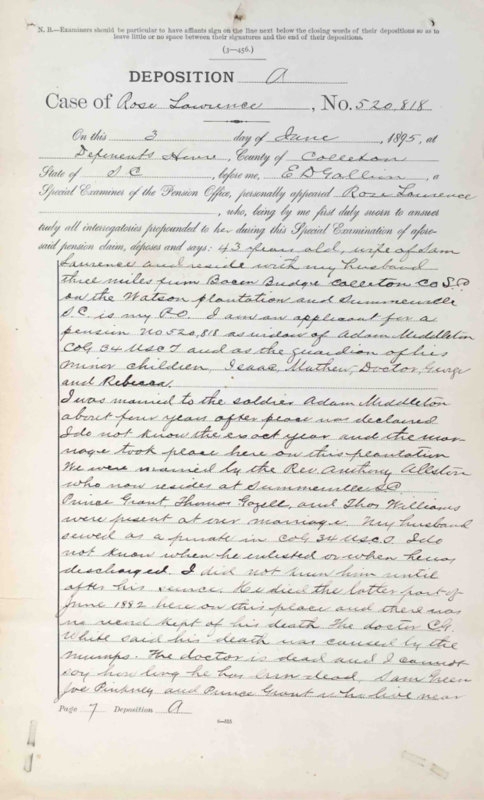 Summary of Letters of Guardianship form, 12 April 1893: Rose Lawrence applied to be appointed guardian of the estate of Doctor Middleton, George Middleton, Mathew Middleton, and Rebecca Middleton, her children. They were under 16-years of age. Summary of statement of Rose Lawrence, 16 May 1892: She was a resident of the Watson place in Colleton County, SC. She stated Mrs. Phyllis Black [Rose’s mother] attended her at the births of Daniel, Matthew, Doctor, George, and Rebecca Middleton, her children with Adam Middleton. Phyllis Black performed all of the duties necessary without the aid of a physician and there were no records kept in the County about the births. Summary of statement of Rose Lawrence, 2 April 1892: She stated she lived in the vicinity of Bacon Bridge, Colleton County, SC. She had been married to Adam Middleton who served in Company G, 34th US Colored Infantry. She was applying for a pension on behalf of Adam’s minor children, Doctor, Matthew, George, Daniel, and Rebecca Middleton. 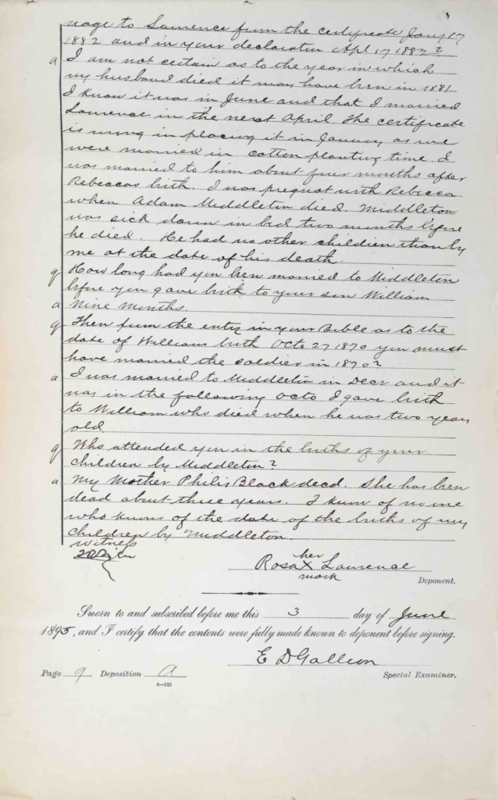 Summary of statement of Rose Lawrence, 14 July 1891: She was the legal guardian of Matthew, Daniel, George, Doctor, and Rebecca Middleton who were the legitimate children of her and Adam Middleton. Adam Middleton enlisted at Charleston, SC in March 1865 and served in Company G, 34th Regiment US Colored Infantry as a private. He was honorably discharged 28 February 1866 and died 20 June 1881. She reported the dates of her children’s births as: Matthew born 8 February 1877, Daniel born 14 March 1875, George born 7 December 1880, Doctor born 5 November 1878, and Rebecca born 24 January 1882. She married Adam Middleton under the name of Rose Harrison. Her husband, at the time of her statement, was Samuel Lawrence. Summary of statement of Samuel Lawrence, 16 May 1892: He was acquainted with Adam Middleton and Rose Lawrence, Samuel’s wife, prior to the war. He knew they lived on the Watson place with him for a number of years. He had seen Adam Middleton’s children and knew that none of them were older than 16-years. 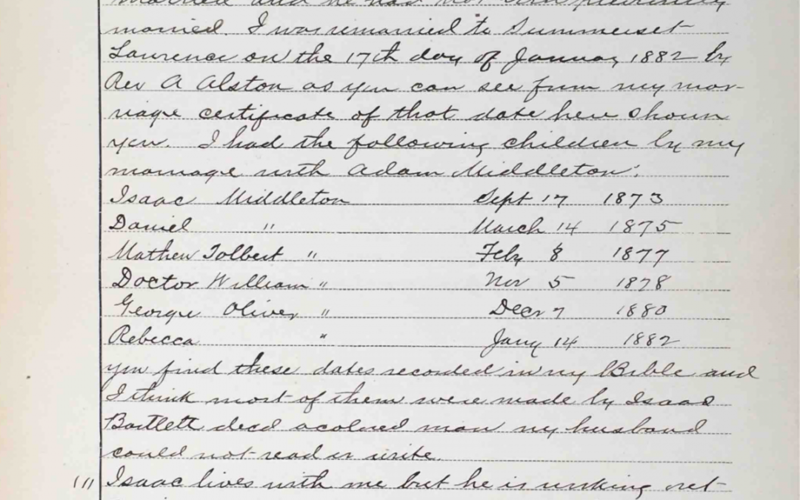 He knew Adam Middleton died in June 1881 and Rebecca, his daughter, was born on the Watson place about 20 January 1882. 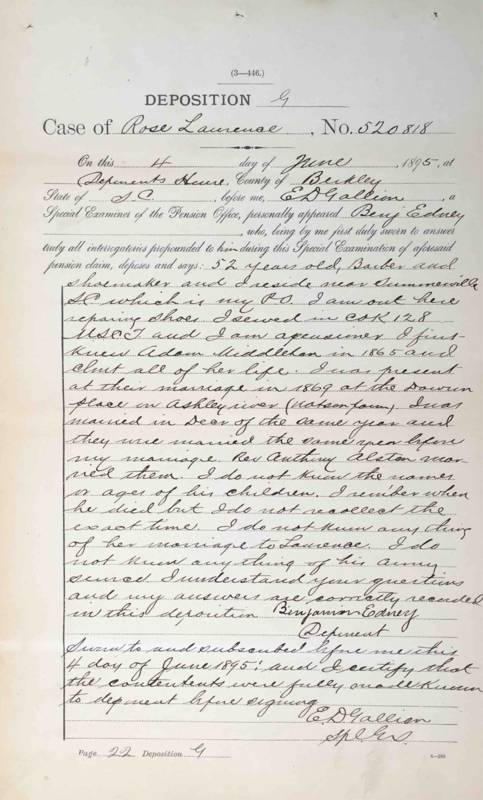 Summary of statements of John C. Campbell and Prince Grant, 27 April 1892: They knew that neither Adam Middleton nor Rose Harrison had been married before they married each other in 1867. Rev. Anthony Allston performed the ceremony. Adam died abut the middle of June 1881. They knew Adam and Rose for over 30-years. John C. Campbell stated he had served in the same regiment with Adam. Summary of statement of Anthony Allston, 8 August 1891: He was the pastor of the Baptist Church at Summerville, SC and was well acquainted with Rose Lawrence. He was also well acquainted with her first husband, Adam Middleton, during his lifetime. He stated he was well acquainted with Samuel Lawrence, Rose’s second husband. Rose’s maiden name was Rose Harrison when she married Adam Middleton on 4 December 1867. Adam died in June 1881 and Rose married Samuel Lawrence on 14 April 1882. Anthony performed the ceremony and knew no legal barrier existed to prevent the marriage. Adam and Rose lived together until Adam died, leaving several minor children to survive him. The records from the Baptist Church at Summerville were destroyed by a fired abut September 1880. 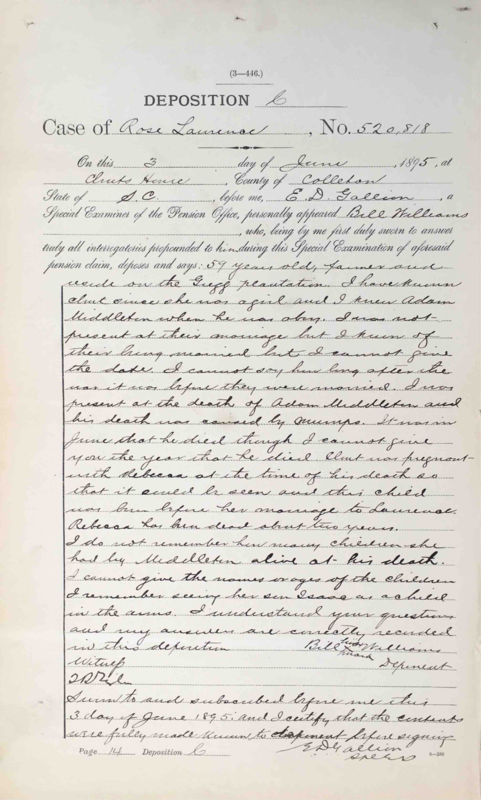 Summary of statements of Samuel Green and Prince Grant, 8 August 1891: They were well acquainted with Adam and Rose Middleton and knew Adam died on 20 June 1881 in Colleton County, SC. They were present, dressed, and laid out Adam’s body. They attended his funeral and burial the following day. They knew that after Adam’s death, Rose married Samuel Lawrence and that Adam left several minor children when he died. They were: Rebecca, George, Matthew, Daniel, and Doctor. They had been neighbors of Adam Middleton and lived on the same plantation as he did. Summary of Military Service form, 27 August 1891: Adam Middleton was enrolled 1 March 1865 and mustered out with his company on 28 February 1866. At enlistment, he was 20-years of age, 5-feet 5-inches tall, with dark complexion, black eyes and black hair. He stated he had been born at Charleston, SC and he worked as a laborer.